I‘m not sure why I second guess myself so much .. I should just go with my gut instincts and run with it. In my previous post, I talked about the binding fabric I was going to use. And I had a pretty good rationale for the green that I had picked too .. but still – I agonized .. and agonized .. and just wouldn’t commit to the fabric I chose. Well I finally put my big girl pants on and followed my gut and logic – “I’m thinking that the medium would look better as it would pull the tops of the middle X blocks out and make them pop more”. So I got my hanging sleeve ready .. I couldn’t do this one the ‘normal’ way I do it as I was doing edge-to-edge quilting, but I could attach the top of it when I put the binding on and stitch it when I do the hand stitching part of the binding. Not sure I’ll do edge-to-edge again tho, the border seams look obvious to me. Normally, I do SID for them – but wanted to try this way. Never know unless you try, right?! Oh back to the sleeve – I pinned it on and away I went. Course I put the binding on the wrong side – but caught it only after doing 6″ so it was easy enough to frog it and start again .. Pix eyed the binding that was dangling off my lap, but decided to behave himself .. (maybe it was the gimlet eye, I giving him?? heh .. yeah right! ), so it was uneventful, I can rather live with some boredom in life on occasion. The medium green looks GREAT and it really does pull the green tops of the blocks out more. Sorry for the blechy shot, nite time and flash again, eh? But I’ll get a better pic tomorrow – maybe outside if the rain decides to stop .. BUT the rain is sort of better than snow .. I only say it that way as I do have a dog – and she LOVES LOVES LOVES water :\. « Mystery Texture – WOWSERS! It has turned out fabulous. I think this is my favorite so far. And the motif is spot on. Great job. Wow, Grace, that is just beautiful! 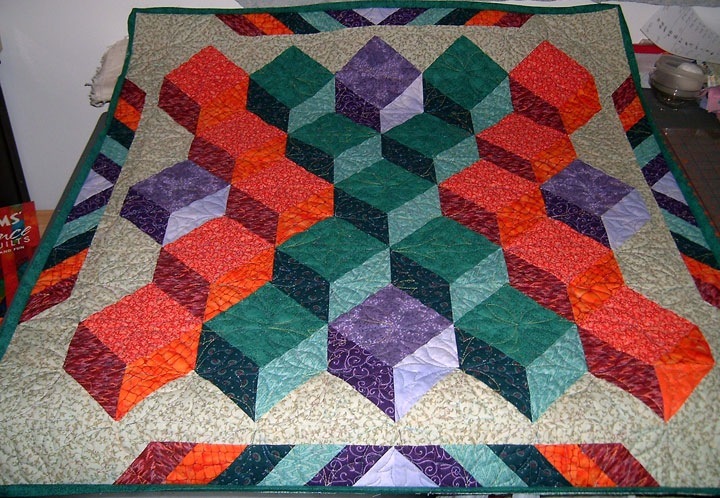 The colors just pop, and the quilting is lovely! This is such a great quilt – like you, I am frequently doubting yself! I’ve noticed one of my often-used phrase is “It turned out better than I thought!” … more of the doubting myself, but I should know by now, a finished quilt is just always gorgeous! I haven’t had a DUD in 20 years … lesson … we’re getting pretty good at this quilting thing! Happy quilt-y weekend. We’re expecting a doozy of a snowstorm, they say! 8-)))) HOpe so. Everything about this quilt turned out great! What kind of batting do you use? I use either a 80/20 blend or 100% cotton and once the quilt is washed everything seems to blend well. Another option is doing an edge to edge in the middle of the quilt and then doing the border separately – I’ve had good success with that. At any rate, the quilt looks great — good choice for the binding.